I am a storyteller, and so, naturally, I love hearing stories from other people. I find the "how we met" story about couples one of the most captivating of stories. This is the backstory of two of my favorite people. About three years ago, my best friend Kim arrived at my northeast Ohio home for a weekend retreat from her home in the Louisville, Kentucky area. It had been many years since our teenage sleepovers, but the topics of conversation were still along the same themes: life, hopes, dreams, and boys. Trying subtly to hide her giddiness, Kim revealed details about her latest love interest, John. She was cautious not to say too much as was her nature in love having come through divorce. Despite her best efforts to hide it, I could see the sparkle in her eyes when she received a text from John. Have you ever known someone eternally optimistic? Someone who walks through the world believing only good things? This is Kim. I met Kim when I was 16 in a chemistry class; I hated the class, felt comparable about the teacher, and I likely owe my passing that class to Kim, who taught me to see the wonder and awe she saw in science. Indeed, she might be single-handedly responsible for instilling in me a love of nature on a deeper, literal cellular level than I previously had before. She introduced me to one of my favorite writers, Annie Dillard, and a love of primitive backpacking. 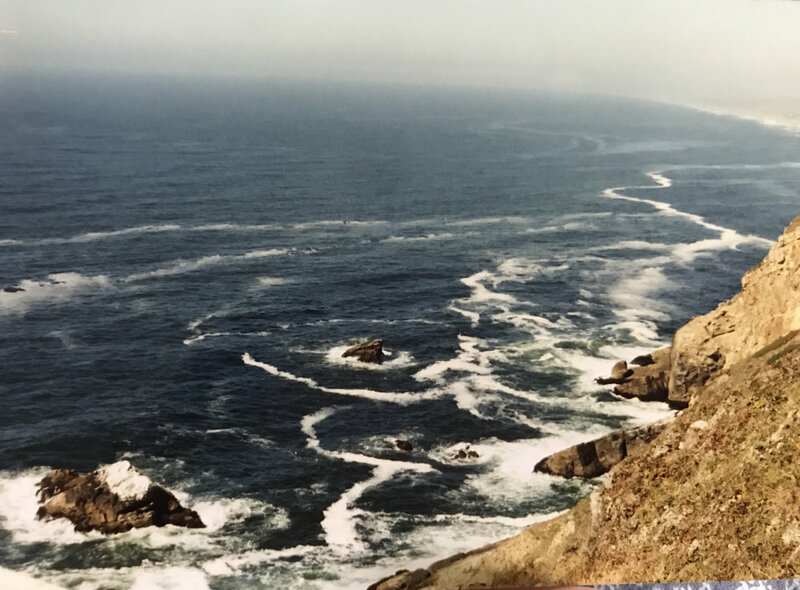 Once, we took a trip out west together and explored Crater Lake, Oregon and, then, Big Sur California - places that were awe-inspiring in their magnificent landscapes in the same magical way Kim saw the universe. Below are some images from that 1994 trip (click on an image to enlarge it). Note the arrow on image #3; it's pointing to an RV parked in a parking lot for a reference to size and shows just how gigantic Crater Lake is! Magic has always followed Kim and she seems to have accepted magic as just simply a part of her life. It's as if she has had a protective magical bubble around her for these 40-some years that's given her the excitement, wonder and sometimes naivete of a child. It was fitting, then, that she became a middle school science teacher...duh! What else could she be?! Among the many things she is, Kim is also a musician. When she moved to Kentucky almost a decade ago, she connected with a group of musicians from The Heartland Songwriters Association of Kentucky (HSAOK). I admire her bravery! Imagine moving to a new state, and then just showing up with a bunch of musicians and playing/singing on stage! A photo I shot of Kim from 2010 shortly after she moved to Kentucky and connected with the Heartland Songwriters' Association of Kentucky. It was through the HSAOK that Kim found a new tribe of friends and, ultimately met John, who was/is also a musician. Kim and John were invited to perform at a guitar pull on November 17, 2013. If you're wondering what a guitar pull is, Kim describes it as a concert based on acoustic songs that showcase 2-3 different songwriters. Here is a flier for that guitar pull. If you're wondering who J.D. Michaels is...that's John. "I stalked him on facebook a few days before [the guitar pull]," Kim admits about John, "and I liked him immediately, but we were both in other relationships." Many months later, fate brought them together again...or was it divinity? Their mutual and very talented friend, Jessica Mathis, who also goes by Divinity Rose, planned a a photoshoot for John for an upcoming CD (you can check out some of her work at www.divinityrose.com). She asked Kim to be a part of the shoot. Kim describes it as serendipity, but I have to wonder if Jessica played divine match-maker that day. These photos tell quite a story! Jessica says they were going for a sort of Mad Max/ancient prophesy/armageddon thing and wow, I think they nailed it! But what's interesting, in hindsight, was that this chance meeting set the stage for a wedding that is the opposite of Mad Max. It set the stage for a fairy tale. Stay tuned for photos from that wedding! Thanks to Jessica Mathis for the use of her awesome photos in this post!